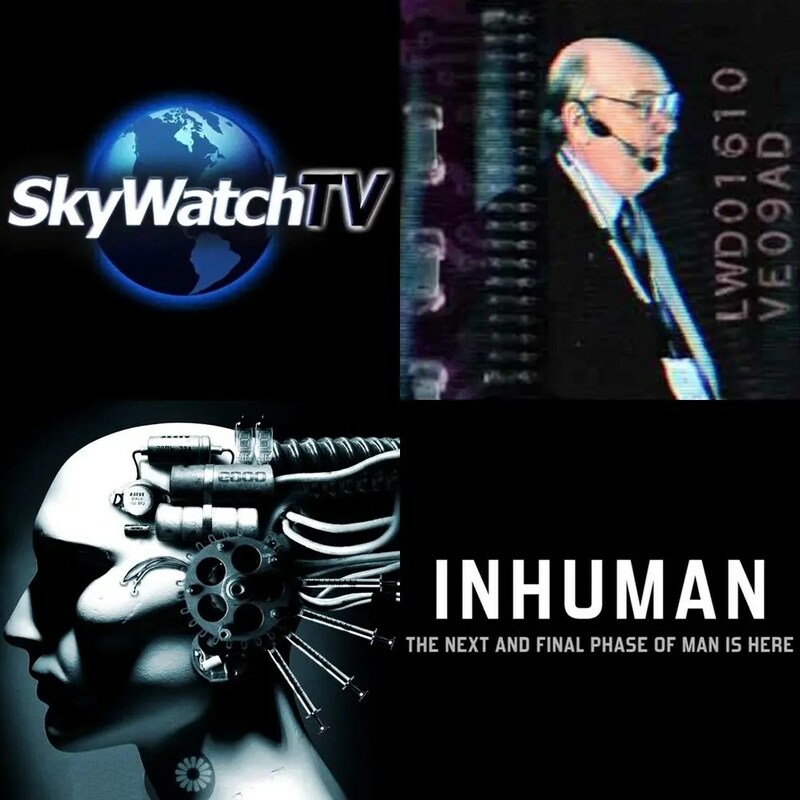 EDITOR’S NOTE: In the countdown to the release of the highly anticipated documentary “INHUMAN: THE NEXT AND FINAL PHASE OF MAN IS HERE” (scheduled for release around August 15), SkyWatch TV will be running an exclusive online series on transhumanism and the dawn of the Human Hybrid Age, starting with the entry below. This extensive multi-year project is not fiction or a mockudrama but a new investigative documentary from the internationally acclaimed team at SkyWatch TV and the new department Defender Films. Inhuman travels the globe to unveil for the first time how breakthrough advances in science, technology, and philosophy—including cybernetics, bioengineering, nanotechnology, machine intelligence, synthetic biology and the new CRISPR gene-editing technology—are poised to create mind-boggling game-changes to everything we have known until now about Homo sapiens. FEATURING (partial list): Dr. Thomas R. Horn, CEO, Defender Films, best-selling author; Dr. James J. Hughes, Executive Director, Institute for Ethics and Emerging Technologies, former President, World Transhumanist Association; Dr. William B. Hurlbut, U.S. President’s Council on Bioethics, Consulting Professor of Neuroscience, Stanford University; Dr. Hugo de Garis, retired Director of the Artificial Brain Lab (ABL), Xiamen University, China; author, The Artilect War; Dr. Natasha Vita-More, Faculty, University of Advancing Technology, Chairman, Humanity+, Fellow, Institute for Ethics & Emerging Technologies ; Wesley J. Smith, Senior Fellow, Discovery Institute, special consultant for the Center for Bioethics and Culture; Sharon Gilbert, Biologist, Futurist ; Dr. Chuck Missler, Technologist, Founder, Koinonia House; Numerous other experts in fields of science, technology, bioethics, sociology, philosophy, and theology. The ability to tinker with our genes offers the astounding promise—and peril—of immortality, which mythically has been the defining difference between gods and mortals. It also offers the possibility of an even greater variety of breeds of humans than there is of dogs. The prospect of building godlike creatures fills me with a sense of religious awe that goes to the very depth of my soul and motivates me powerfully to continue, despite the possible horrible negative consequences. In recent years, astonishing technological developments have pushed the frontiers of humanity toward far-reaching morphological transformation that promises in the very near future to redefine what it means to be human. An international, intellectual, and fast-growing cultural movement known as transhumanism, whose vision is supported by a growing list of U.S. military advisors, bioethicists, law professors, and academics, intends the use of genetics, robotics, artificial intelligence and nanotechnology (Grin technologies) as tools that will radically redesign our minds, our memories, our physiology, our offspring, and even perhaps— as Joel Garreau, in his bestselling book Radical Evolution, claims—our very souls. Unfortunately for mankind, the technological and cultural shift now underway not only unapologetically forecasts a future dominated by a new species of unrecognizably superior humans, but an unfathomable war—both physical and spiritual—that the world is not prepared for. It will be fought on land, within the air and sea, and in dimensions as yet incomprehensible. Even now, the synthetic forces that will plot man’s wholesale annihilation are quietly under design in leading laboratories, public and private, funded by the most advanced nations on earth, including the official governments of the United States, France, Britain, Australia, and China, to name a few. As a result of progressive deduction, reasoning, and problem solving in fields of neurotechnology and cybernetics, strong artificial intelligence or “artilects” will emerge from this research, godlike, massively intelligent machines that are “trillions of trillions of times smarter than humans” and whose rise will prove profoundly disruptive to human culture, leading to a stark division between philosophical, ideological, and political groups who either support the newly evolved life forms as the next step in human and technological evolution or who view this vastly superior intellect as an incalculable risk and deadly threat to the future of humanity. These diametrically opposed worldviews will ultimately result in a preemptive new world war—what is already being described as gigadeath, the bloodiest battle in history with billions of deaths before the end of the twenty-first century. For those who find the fantastic elements in the statements above implicative of science fiction or even future Armageddon as forecast in the ancient apocalyptic and prophetic books of the Bible, the catastrophic vision is actually derived from near-future scenarios, which leading scientists like Prof. Hugo de Garis (featured in the upcoming documentary INHUMAM), director of the Artificial Brain Lab at Xiamen University in China, outlines in his book, The Artilect War: Cosmists vs. Terrans: A Bitter Controversy Concerning Whether Humanity Should Build Godlike Massively Intelligent Machines, as unfolding due to exponential growth and development this century in grin technologies. The human group in favor of building artilects, I label the “Cosmists” [to whom] building artilects will be like a religion something truly magnificent and worthy of worship. The second human group, opposed to the building of artilects, I label the “Terrans” who will argue that allowing the Cosmists to build [artilects] implies accepting the risk, that one day, the artilects might decide that the human species is a pest. Since the artilects would be so vastly superior to human beings in intelligence, it would be easy for [them] to exterminate the human species. Professor de Garis continues in his book to describe how the work to build artilects is proceeding nonetheless with anticipation of its realization potentially close at hand. As a result, he falls asleep at night thinking about the godlike synthetic intelligence he and others are constructing. Sometimes his mind becomes enraptured of his creations with a sense of intellectual and spiritual awe. Then, waking up a few hours later in a cold sweat, he is jolted from bed by a horrific dream in which vivid scenes depict the slaughter of his descendents at the hands of the artificial deities. Crazy or not, Kaczynski may be right in that man’s demise at the hands of machines will happen gradually, during which time we humans will become the proverbial frogs in the kettle set to boil. On the other hand, we are more likely to be reduced any day now in the blink of an enhanced eye to the status of domestic animals in the minds of artificial intelligence, as Technological Singularity—that magical future moment that many futurists and tech experts believe could be imminent—gives birth overnight to some version of the artilects, who suddenly come online as conscious, living super-minds, immensely more powerful than human beings. Our version 1.0 biological bodies are frail and subject to a myriad of failure modes.¼ The Singularity will allow us to transcend these limitations. We will gain power over our fates. Our mortality will be in our own hands [and] the nonbiological portion of our intelligence will be trillions of trillions of times more powerful than unaided human intelligence. We are now in the early stages of this transition. The acceleration of paradigm shift as well as the exponential growth of the capacity of information technology are both beginning to reach the “knee of the curve,” which is the stage at which an exponential trend becomes noticeable. Shortly after this stage, the trend becomes explosive. [Soon] the growth rates of our technology—which will be indistinguishable from ourselves—will be so steep as to appear essentially vertical.¼ That, at least, will be the perspective of unenhanced biological humanity. In 1993, critical thinking about the timing of the Singularity concerning the emergence of strong artificial intelligence led retired San Diego State University professor and computer scientist Vernor Vinge, in his often-quoted and now-famous lecture, “The Coming Technological Singularity,” (delivered at Vision-21 Symposium sponsored by Nasa Lewis Research Center and the Ohio Aerospace Institute), to add that when science achieves “the technological means to create superhuman intelligence[,] shortly after, the human era will be ended.”[vii] In contrast to Vinge, cyborgists like Kevin Warwick, professor of cybernetics at Reading University in England who endorsed de Garis’ book, believe Singularity will not so much represent the end of the human era as it will the assimilation of man with machine intelligence, like the Borg of Star Trek fame. This is because, according to Warwick, Technological Singularity will not occur as a result of freestanding independent machines, but inside human cyborgs where human-machine integration is realized and enhanced biology is recombined to include living brains that are cybernetic, machine readable, and interfaced with artificial neural networks where transhumans with amplified intelligence become so completely superior to their biological counterparts (normal humans) as to be incomprehensible—ultimately “posthuman.” The technology to accomplish this task is already well underway and is considered by researchers like Warwick to be one of the most important scientific utilities currently under employment toward man’s posthuman future. As a result of this bridge between technology and human biology being attained this century, nothing less than the wholesale redesign of humans, including genetic integration with other life-forms—plants, animals, and synthetic creations—will be realized. This vision—the borgification (marriage between biology and machine) of man—is supported in the 2010 “State of the Future” report by the global think tank, the Millennium Project, founded after a three-year feasibility study with the United Nations University, Smithsonian Institution, and the Futures Group International, where synthetic biologists affirm that “as computer code is written to create software to augment human capabilities, so too genetic code will be written to create life forms to augment civilization.”[viii] Furthermore, as biotech, infotech, nanotech, and cognotech breakthroughs quickly migrate with appropriate synergies to create widespread man-machine adaptation within society, a “global collective intelligence system [hive supermind] will be needed to track all these science and technology advances,” the report goes on to say. Though the transformation of man to this posthuman condition is in its fledgling state, complete integration of the technology necessary to replace existing Homo sapiens as the dominant life-form on earth is approaching Kurzweil’s exponential curve. While today most people are talking about the powerful new gene-editing technique CRISPR, this idea is not new. A Reuters article dated November 9, 2009, titled “Scientists Want Debate on Animals with Human Genes,” hinted at just how far scientists had already come and how far they intend to go. The news piece started out, “A mouse that can speak? A monkey with Down’s Syndrome? Dogs with human hands or feet? British scientists want to know if such experiments are acceptable,” and it continued with revelations that scientists inside Britain are comfortable now with up to 50/50 animal-human integration. The article implied that not all the research currently under design is kept at the embryonic level, and that fully mature monstrosities (like the creature in the 2010 movie Splice) may be under study as “some scientists in some places want to push boundaries.” National Geographic magazine speculated in 2007 that within ten years (2017), the first of such human-animals would walk the earth, and Vernor Vinge agreed recently that we are entering that period in history when questions like “What is the meaning of life?” will be nothing more than an engineering question. Most readers may be surprised to learn that in preparation of this posthuman revolution, the United States government, through the National Institute of Health, has steadily granted tax-payer monies to such institutions as Case Law School in Cleveland ($773,000) to develope the actual guidelines that are to be used for setting government policy on the next step in human evolution–“genetic enhancement.” Maxwell Mehlman, Arthur E. Petersilge Professor of Law, director of the Law-Medicine Center at the Case Western Reserve University School of Law, and professor of bioethics in the Case School of Medicine, led the team of law professors, physicians, and bioethicists over the two-year project “to develop standards for tests on human subjects in research that involves the use of genetic technologies to enhance ‘normal’ individuals.”[x] Following the initial study, Mehlman began offering two university lectures: “Directed Evolution: Public Policy and Human Enhancement” and “Transhumanism and the Future of Democracy,” addressing the need for society to comprehend how emerging fields of science will, in approaching years, alter what it means to be human, and what this means to democracy, individual rights, free will, eugenics, and equality. Other law schools, including Stanford and Oxford, are now hosting similar annual “Human Enhancement and Technology” conferences, where transhumanists, futurists, bioethicists, and legal scholars are busying themselves with the ethical, legal, and inevitable ramifications of posthumanity. More recently, as reported by SkyWatch TV, bioethicist Wesley J. Smith (also featured in INHUMAN) wrote how the White House—despite playing word games around gene-editing techniques—fully intends to manufacture GMO people. 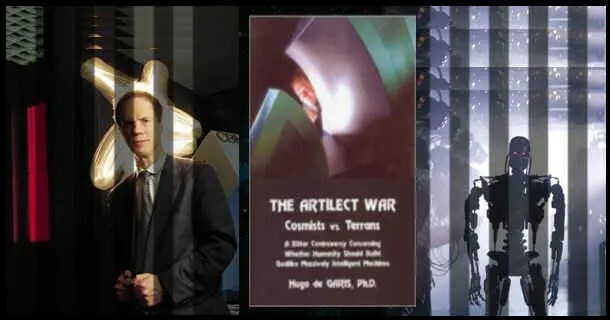 [i] Hugo de Garis, The Artilect War: Cosmists vs. Terrans: A Bitter Controversy Concerning Whether Humanity Should Build Godlike Massively Intelligent Machines E(Palm Springs, CA: ETC, 2005) 11–12, 15, 84. [ii] Theodore Kaczynski, “Industrial Society and Its Future,” Wikisource, http://en.wikisource.org/wiki/Industrial_Society_and_Its_Future. [iv] Ray Kurzweil, The Singularity is Near (New York: Penguin, 2006) 7–8. [v] Abou Farman, “The Intelligent Universe,” Maison Neuve (8/ 2/10) http://maisonneuve.org/pressroom/article/2010/aug/2/intelligent-universe/. [vii] “The Coming Technological Singularity,” presented at the Vision-21 Symposium sponsored by Nasa Lewis Research Center and the Ohio Aerospace Institute (3/30–31/93). [viii] Jerome C. Glenn, “The State of the Future” (7/14/10) www.kurzweilai.net/the-state-of-the-future, emphasis added. [x] Case Western Reserve University, “Case Law School Receives $773,000 NIH Grant to Develop Guidelines for Genetic Enhancement Research: Professor Max Mehlman to Lead Team of Law Professors, Physicians, and Bioethicists in Two-Year Project (April 28, 2006).